Despite having high levels of awareness and trust, Samaritans were increasingly seen as less and less relevant, especially by younger audiences. Many saw Samaritans as purely a ‘listening service’ or the helpline not as the fully rounded support service it is. As a result Samaritans felt a strong need to reassert their role and relevance within public consciousness. Every life lost to suicide is a tragedy and Samaritans believe these tragedies are preventable. So to help them in their aim to reduce the numbers of lives lost Samaritans decided they needed a to rejuvenate their brand to broaden their appeal. Part of this was to further develop tools to help people to cope, moving beyond the ‘crisis point’ helpline to develop new tools that help people when they’re struggling to cope, before they reach rock bottom. The aim of the rebrand was for Samaritans to continue to help people in their toughest moments with key crisis support but also to help the organization in reaching more people who are struggling to cope more generally too. 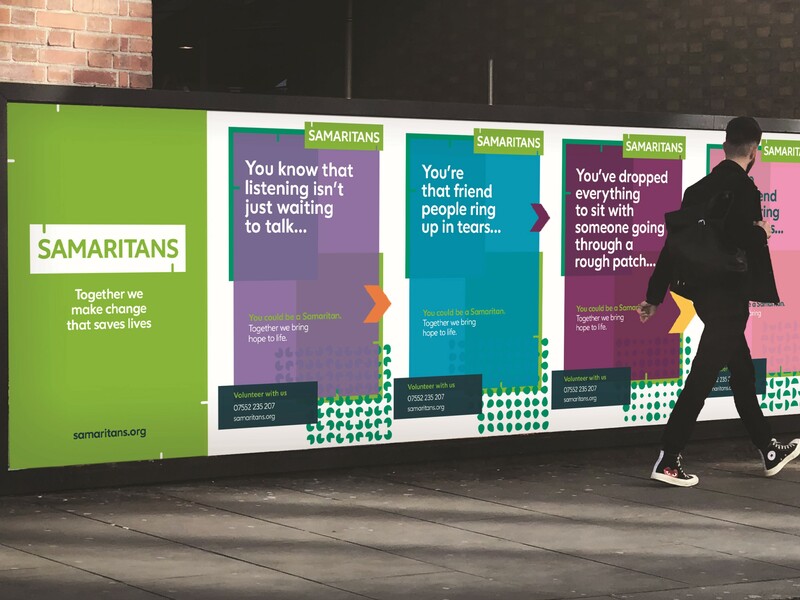 To support a new, wider strategic direction, the Samaritans brand needed to reach and connect with a larger, more diverse range of audiences, to show people who Samaritans are, what they do and how they do it, whilst importantly helping the charity stand out in an increasingly noisy and crowded space. Our brand agency Spencer du Bois worked closely together with Samaritans to co-create a reinvigorated brand that suited their needs. Taking an audience insight based co-creative approach, we undertook internal strategic workshops, focus groups, web surveys and in depth telephone interviews, to understand what the Samaritans audience thought, and knew, about the charity. The feedback from this was that what worked universally well across all audiences at the core of the brand, was the ‘life affirming’ ‘power of human connection’, something we can all associate with. As a result this insight was key when it came to building the new brand positioning, set of key messages and visual identity. The new positioning and messaging are not just about modernisation – they’re about relevance and the life affirming power of human connection works on so many levels. It’s a powerful positioning that so many people can engage with. Importantly though, this has also helped move the brand out of the marketing department and into the heart of the organisation, from board decisions to digital product planning – ensuring the power of human connection is fully embedded at the heart of everything the charity does. Samaritans also refreshed its visual identity to include a new logo with its subtle connectors, which were inspired by the refreshed focus on human connection. In turn it is these connections that not only give the new visual identity strength but also create openness, change, growth and focus – elements that also flow throughout every detail of the new brand. With the new identity Spencer du Bois have created a visual revolution for the Samaritans to help them engage with, and recruit volunteers, raise more money and importantly help those in need to reconnect with powerful qualities they already have, but may have lost sight of. These positive qualities of humanity also inspired the patterns and quirky details in the typeface to reflect individual personalities. As well as influencing a visual system that has been designed to move and animate across all environments – whether it’s a platform to tell the story on film, a framework to help re-connect with life-affirming moments on social media or physically building 3D environments to help people connect face to face. Meanwhile the brand colour remains green, symbolising positivity and hope, and but taking heed of the research, the font has been refreshed to be more modern and relevant. This is also reflected in the new photographs which have been specifically chosen to tell powerful, real life stories showing moments where people connect with one another. With a reinvigorated new brand Samaritans are set to benefit from a wider range of well targeted messages, a more engaging visual identity with greater impact and a wider range of assets that allow the brand to be adapted to the each campaign or opportunity or channel. This includes campaigning to make suicide prevention a priority with government and working with other relevant organisations.